Dr. Truong is Fellow in Minimally Invasive Gynecologic Surgery, Columbia University Medical Center, New York, New York. Dr. Advincula is Levine Family Professor of Women’s Health, Vice-Chair, Department of Obstetrics and Gynecology, and Chief of Gynecology, Sloane Hospital for Women, Columbia University Medical Center, New York, New York. He also serves on the OBG Management Board of Editors. Dr. Truong reports no financial relationships relevant to this article. Dr. Advincula reports being a consultant to Blue Endo, CooperSurgical, Intuitive Surgical, and Surgiquest and receiving royalties from CooperSurgical. As a result of recent concerns regarding the use of power morcellation, clinicians have been faced with the need to develop alternative techniques for contained tissue extraction during minimally invasive gynecologic procedures such as myomectomy and hysterectomy. 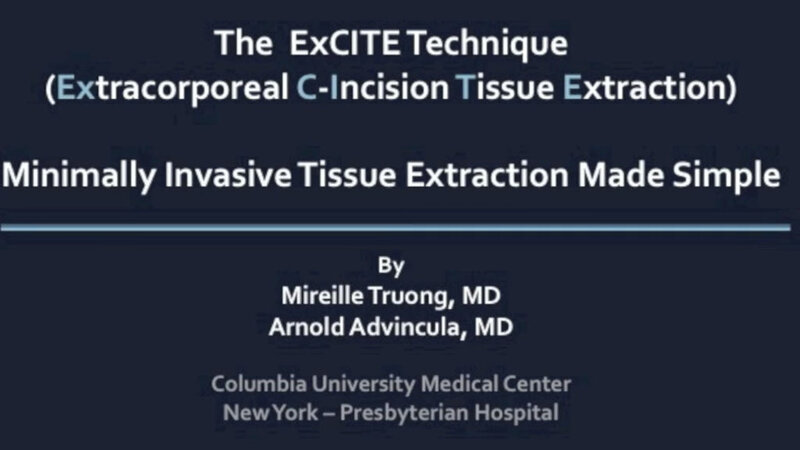 ability to continue to offer minimally invasive surgical options to patients through a safe and standardized approach to tissue extraction. The example case is real-time, contained, intact removal of an 8-cm, 130-g fibroid. I hope you enjoy the featured opening session on best tissue extraction standards at the AAGL Global Congress on Minimally Invasive Gynecology in ­Vancouver and stop by to visit me at the OBG Management booth.